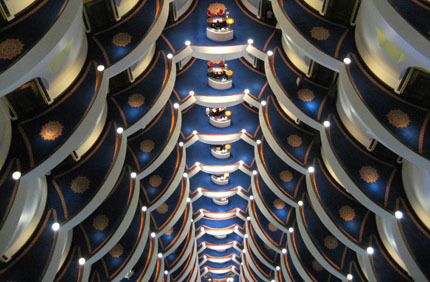 Dubai's iconic building is a construction of superlatives. 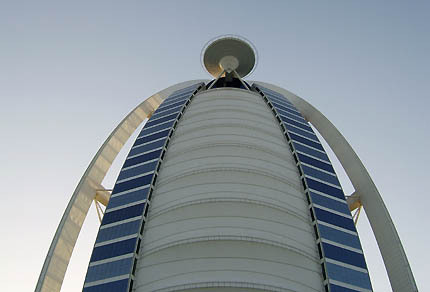 The world's tallest hotel (321 meters) is also popularly described as the world's only 7-Star hotel - although its formal rating is 5 Star Deluxe, the highest the international rating system offers. 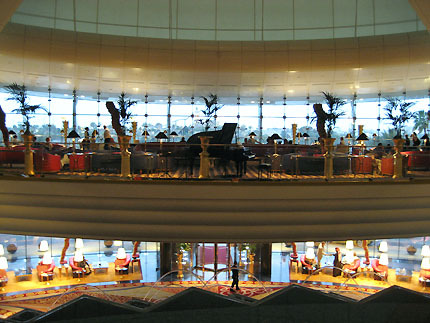 Also extending from the top floor is the Skyview Bar, with sunset views over the Gulf, including the artificial Palm Jumeirah island and The World archipelago. 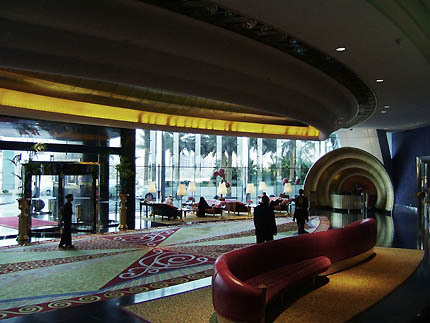 Inside, the superlatives mostly translate into extreme gaudiness, with gold leaf applied more for quantity than design. 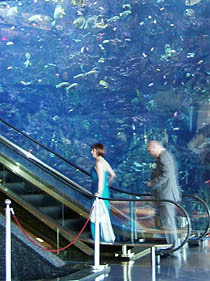 There is little subtlety in the decor of the communal entrance areas, with the exception of the dramatic larger-than-life aquaria lining the escalators (top-right picture). The front (shore-facing) facade is constructed of two tiers of huge, steel 'X' trusses. Below these, full-width windows provide panoramic views from two levels of entrance lobby, unencumbered by structural support. 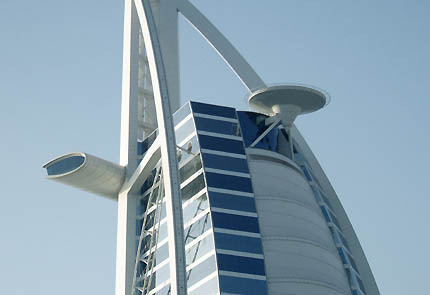 Above these first two levels, the facade outside of the trusses is made up of translucent white fabric stretched around the structural frame - the sail of the dhow that the building's shape is inspired by. 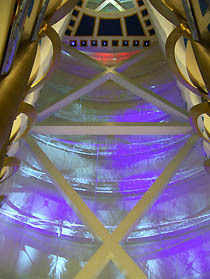 During the day, this white wall glows to illuminate the full-height atrium (at 180 meters, the world's tallest). 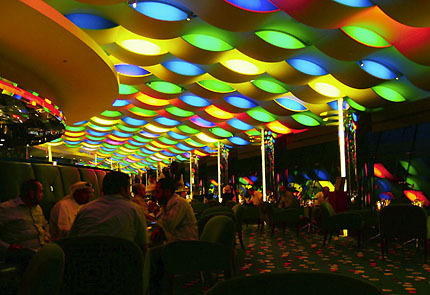 At night, a complex arrangement of changing projected lighting makes Burj Al Arab a changing beacon seen from outside, while providing a dramatic illuminated show seen from the atrium within. 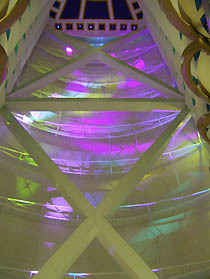 On the opposite side of the atrium, the floors are organized around corridor 'galleries' that open onto the atrium space. 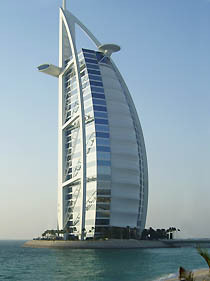 Burj Al Arab's web site is at www.burj-al-arab.com. The architect's personal web site, with interesting details on the building's design and construction, is at www.tomwrightdesign.com.